With all due deference to screenwriter Anthony McCarten, who has crafted a solid narrative around the early days of Winston Churchill as Prime Minister, much of the success of this film must go to another writer. That author is the central character of this film and perhaps the most important historical figure of the last century. The high points of this film all center around addresses that he made to Parliament, the Nation, or to an inner circle of confidants and political rivals. As a Speech instructor, it is understandable then how I can be moved and consequently passionate about this movie. There is something in the air this last year because this period of time has been the subject of several films over the last twelve months. “Dunkirk“, “Their Finest“, and “Churchill” have all been released in 2017. 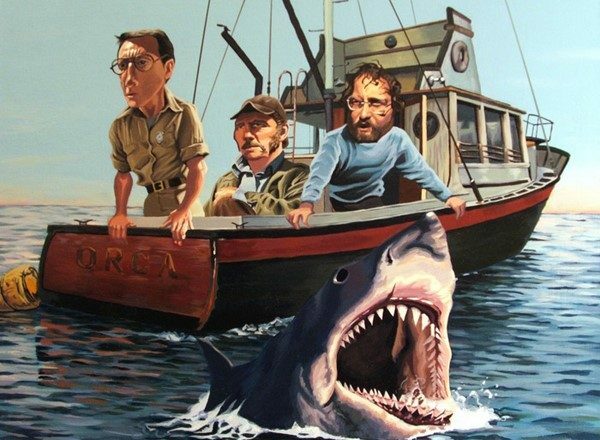 While I have not seen the later, the other two are strongly related to the events depicted in this film. One of my colleague on-line, a British citizen, schooled me in the attitudes toward patriotism in Great Britain. He suggests that it is acceptable to be proud of the history and heritage but not to draw attention to it as we Americans are wont to do. I can appreciate the cultural norm of humility, but being an American I do not feel bound by it. Great Britain stood up to one of the greatest evils in the history of the world, and for a time stood alone. The wherewithal to do so was inspired substantially by their wartime leader, a man that every free person should be willing to acknowledge. Churchill was far from perfect, he had a history of failures and his views on some subjects would be viewed very dimly by most people today. He was however, the right man at the right time and place. Speaking of the right man, actor Gary Oldman, who has been a favorite of mine since the days of “Sid and Nancy”, rightly deserves the talk he is getting about winning an Academy Award. This is a intricate portrayal of a complex character, who was fiercely convinced of his correctness but was also cognizant of the circumstances he found himself in. 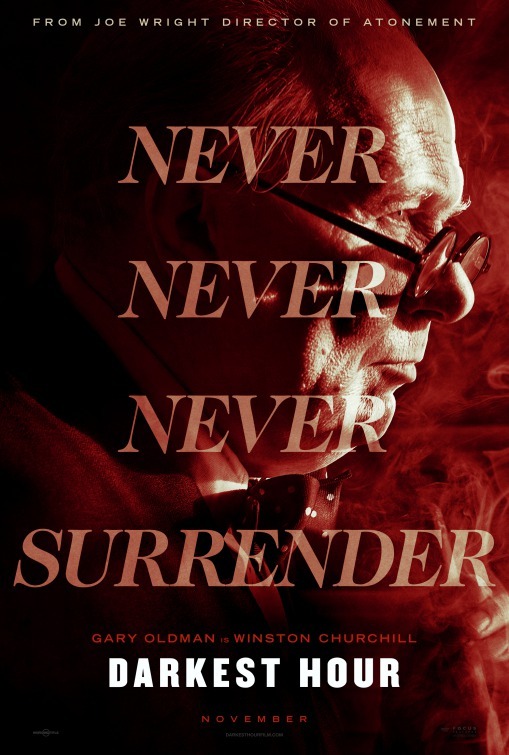 Certainly the make-up artists that transformed his visage into Churchill will deserve a share of the credit, but the lion’s share goes to Oldman. He is able to summon doubt and conviction almost simultaneously in some scenes.If you have ever listened to Churchill’s wartime speeches, you will hear the grumbling and muttering and dry delivery. Oldman manages to duplicate the manner of those speeches but imbue them with enough theatricality to make them compelling to watch in a feature film. He stays true to Churchill’s demeanor but adds a spark of charisma to the settings. Director Joe Wright has made very good films in the past (Atonement/Pride and Prejudice), but he has also stumbled at times (The Soloist/Pan). He makes several choices here that I think work well for the focus of the film. Although the subject is war, the depiction of the war is cinematically visualized without dwelling on the combat. A series of overhead shots, usually accompanied by an airplane swipe across the screen, gives us a bird’s eye view of the events that are taking place on the ground without turning the movie into a combat film. In a similar fashion, Churchill is shown at times as an isolated figure in a sea of hostility by lighting and again the use of an overhead shot. The contributions of the screen writer probably include the frequently uncomfortable conversations that Churchill had with the King. Certainly, the inspiring ride on the underground is an imagined event that helps the Character know the mind of the British people more forcefully. My memories of my British Public Address graduate seminar, helped give me a little context to the Parliamentary process, but I think anyone would be able to fathom what is going on and what it all means by simply following the cues that McCarten has laid out for us. It may be an old school concept to give us a running slide of calendar days but it works well in building some urgency, even though there is little action in the story. The film makers have managed to put together a very watchable narrative that is not driven by great events but rather by great oratorical moments. I may sometimes be blinded by my own sense of righteousness concerning the events of World War II. I like history and I admire the figures who made a difference in the world, regardless of revisionist social norms. Let’s hope that enough young people get exposed to this story before they start reading about this in school. I don’t think movies should be our main source of knowledge about history, but like Spielberg’s “Lincoln“, “Darkest Hour” manages to make an historical figure the giant that he truly deserves to be.